A labeling error in the packaging of Advocate Redi-Code+ BMB-BA006A blood glucose test strips may cause confusion about which meter models the strips are designed to be used with. As shown in the picture below the manufacturer omitted to write the name of the meter model (BMB-BA006A) with which the strips have to be used. 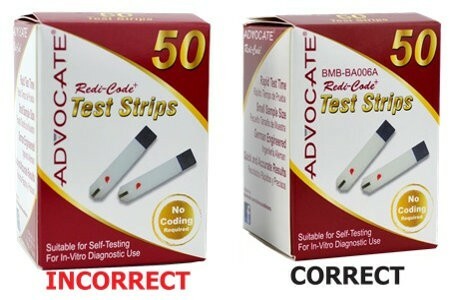 The confusing labelling may lead customers to believe they can use these test strips with the Advocate Redi-Code blood glucose meters, model numbers TD-3223E, TD-4223E, TD-4223F, TD-4276 manufactured by Taidoc Technology Corp which could result in incorrect glucose results. Incorrect glucose results may lead customers to choose inappropriate treatment which could ultimately result in serious personal injury or death.